Tries of big annual rate increases and expensive data services? Now, for a limited time, KVH is making it even easier to switch to a mini-VSAT Broadband service and enjoy an end-to-end SATCOM solution that will change how you think about being connected at sea! With KVH, get the security of broadband Internet and crystal-clear voice service wherever your vessel goes, but at rates that make it affordable to actually use! 1. Purchase a mini-VSAT from us and subscribe to any eligible rate plan with a 36-month term between 1st May 2015 and 31st December 2015. 2. Fill out the upgrade claim form. 3. Send the form along with a copy of your current Inmarsat Fleet Broadband bill to KVH. Contact ITatSea today for further details. We are looking for someone with a broad range of IT skills to provide technical support to our clients and to assist with project work and onsite visits where required. The role is varied and will involve some international travel to attend merchant vessels and perform IT hardware/software upgrade work by following detailed procedures. 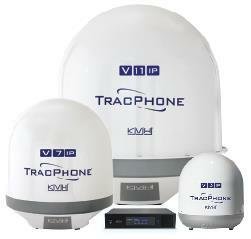 A TracPhone V3 system ($16,995 RRP) & a M1000 mini-VSAT Broadband airtime contract (1 GB/month; value $999/month) for only $999 per month. IT@Sea a growing South Manchester based ICT Consultancy Company specialising in the shipping, maritime and offshore business sectors are seeking motivated individuals to work on a unique IT project. The 3-axis, gyro-stabilized TracPhone V7-IP is an enterprise-grade, feature-packed Ku-band maritime VSAT terminal that brings always-on broadband connectivity, crystal clear voice, and simplified network management to today’s digital vessel, all via the world’s No. 1 maritime VSAT service – mini-VSAT Broadband. A Modern Day Maritime Curse? Read our article on the challenges of anti-virus software as published in “The Digital Ship” magazine. Most IT Technicians who attend ships would agree that the unexpected presence of viruses on shipboard computers is a frustrating and often time-consuming problem. The original work schedule can be radically affected by the sudden requirement to remove viruses from infected computers and repair the damage that has been caused by them. VSAT is a 2 way satellite connection that allows high speed data connections ranging from 56Kbit to 4Mbit per second. It connects a remote earth station such as a commercial shipping vessel to a shore network such as the Internet. That’s a summary of what VSAT is but in reality the subject is much more complicated. VSAT is a way of communicating with your fleet typically for fixed a monthly fee you get an always on connection to the Internet for data such as web and email, with cheap voice calls thrown into the deal. Traditionally commercial vessels have used services from Inmarsat or Irdium that charge the customer for what is used, which is fine if you limit your voice conversations and what you send over email. “The Digital Ship” magazine published our article covering the technical challenges of IP communication over satellite. Read the full article here. With the launch of Inmarsat Fleet Broadband, Iridum OpenPort and a wider choice of VSAT, finally reliable IP communication is now possible at sea. However, installing the satellite terminal has proven to be the easy part of the IP jigsaw. Figuring out how much data you are paying for, and matching your airtime bills against what your software is reporting is a difficult and sometimes impossible task.